Welcome to week 2 of Princess and the Frog! These foods aren’t as memorable in the movie, all except for the Swamp Gumbo. The desserts come from Tiana’s trippy song about her restaurant. There were some yummy foods shown there and the Swamp Gumbo was really fun to make. If you like what you see, please support us on Patreon! We get to provide you with better content and you get some awesome perks! So there are a lot of mousses shown on the table in Tiana’s fantasy restaurant song. They’re pretty much all just iterations of the same mousses though, so I made a 3 different mousses. White Chocolate, Chocolate, and Strawberry. 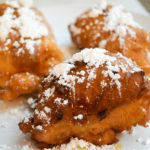 And actually, the mousses fit into the other recipes on the blog today. 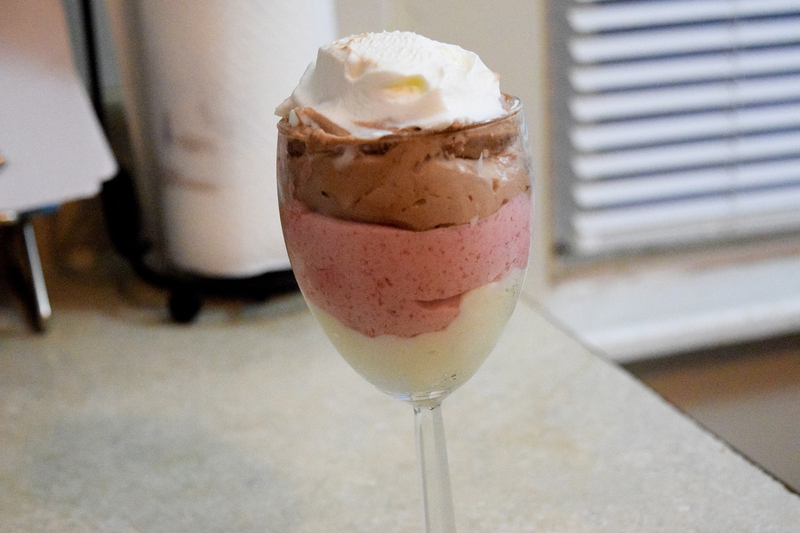 So for this Neapolitan mousse, here’s the recipe for the White Chocolate. 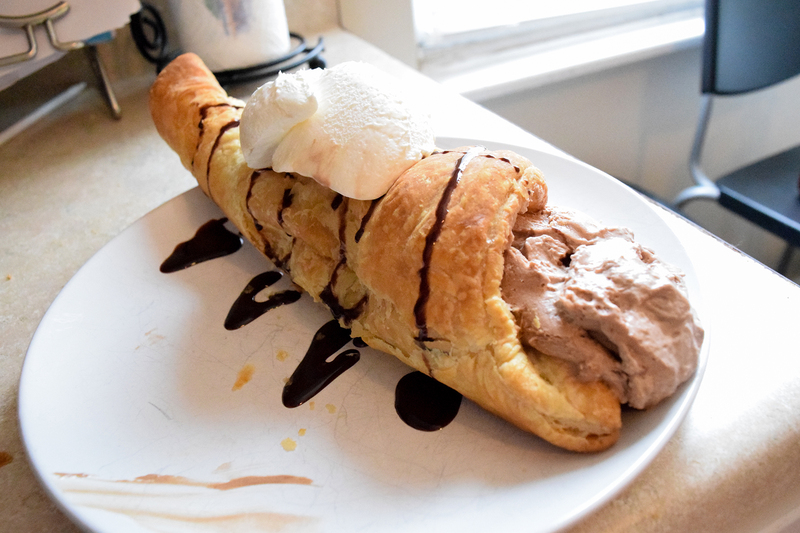 The next recipe will feature the Strawberry Mousse and the Chocolate Horn Pastry will feature the Chocolate Mousse. Just make all three of those and layer them for the Neapolitan Mousse. Spoon the white chocolate mousse into 4 serving cups and refrigerate until set, approximately 1 hour. 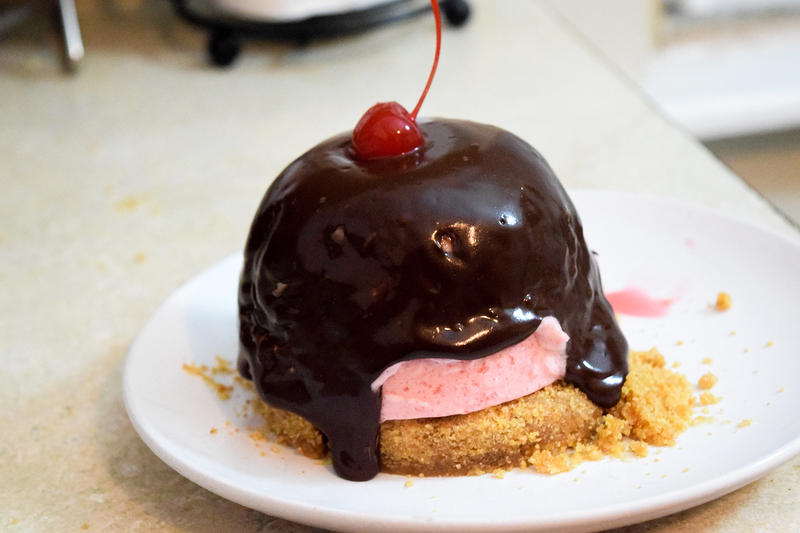 That dome looks like a strawberry mousse on a graham cracker crust and a chocolate ganache. In a small saucepan over very low heat, cook the berries, sugar, lemon juice, and water until very liquid, about 30 minutes. Strain the mixture through a sieve and let cool completely. You should have about 1 1/4 Cups of strawberry juice. Pour 3/4 cup of the juice into a small bowl and sprinkle the gelatin over the surface to soften. Reheat the remaining juice until it is warm to the touch. Add the softened gelatin mixture to the warm juice and whisk until the gelatin has completely dissolved. In a stand mixer with the whisk attachment, whip the cream until it holds medium peaks. Fold one-third of it into the strawberry mixture. Gently fold in the remainder until no streaks remain. In a saucepan, heat the cream, stirring frequently to discourage scorching, until it begins to simmer and seems like it might start boiling any moment (but don't let it boil). 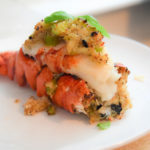 Remove from heat and whisk in the remaining ingredients until smooth. Let the mixture cool to your desired thickness. It will never become hard, per se, but it will set to a smooth, spreadable consistency. Cut the prepared graham cracker crust into a circular shape the size of the mousse mold. Run the outside of the mousse mold under warm water for a few seconds, the mousse should slide out easily on top of the crust. This is some kind of cone pastry with chocolate inside. This is what we’re using the chocolate mousse for! A perfect filling for a cone pastry. Heat 3/4 cup cream in a 1-quart heavy saucepan until hot. Whisk together yolks, sugar, and a pinch of salt in a metal bowl until combined well, then add hot cream in a slow stream, whisking until combined. Transfer mixture to saucepan and cook over moderately low heat, stirring constantly, until it registers 160°F on thermometer. Pour custard through a fine-mesh sieve into a bowl and stir in vanilla. Melt chocolate in a double boiler or a metal bowl set over a pan of simmering water (or in a glass bowl in a microwave at 50 percent power 3 to 5 minutes), stirring frequently. Whisk custard into chocolate until smooth, then cool. Beat remaining 1 1/4 cups cream in a bowl with an electric mixer until it just holds stiff peaks. Whisk one fourth of cream into chocolate custard to lighten, then fold in remaining cream gently but thoroughly. Spoon mousse into 8 (6-ounce) stemmed glasses or ramekins and chill, covered, at least 6 hours. Roll tin foil around an ice cream cone, another oven-safe conicle object or create one with the tin foil. The swamp gumbo was really fun to make. I couldn’t find a pumpkin at this time of year, but I did find an acorn squash, which looks and tastes very similar. The same principles would apply to cooking in a pumpkin. I tried to find veggies that you would find around New Orleans and cook it as close to how she would. I think it turned out pretty well. Make sure to mince up your veggies! 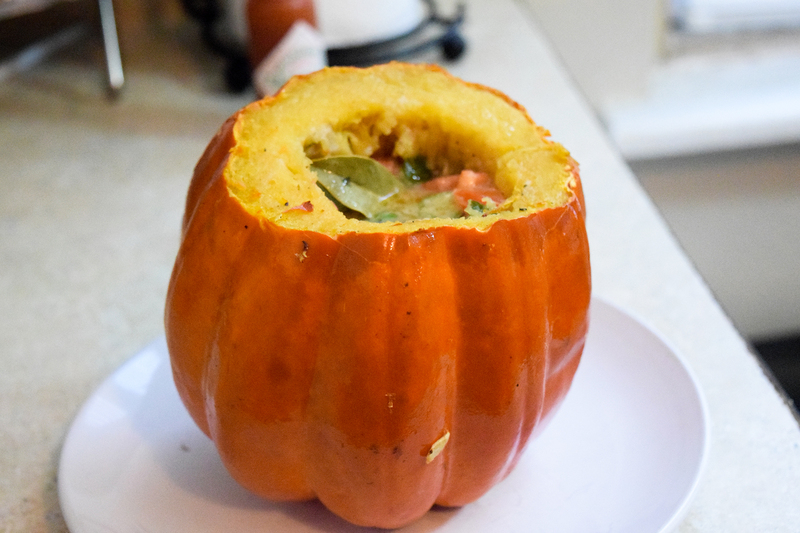 Eat straight out of the pumpkin! Will it turn you into a Prince? I really really liked the mousse. The white chocolate was probably my favorite, followed close behind by the strawberry. But they were all almost equally good. The swamp gumbo wasn’t as good as the gumbo of last week, but it was still really good and vegetarian!